I am hosting Easter brunch at my house on Sunday for my parents and Mike's parents. In retrospect this might not have been the best idea since our dining room is still in the state you all saw it in a few weeks ago (we are making very slooooow progress on this little house project!) Luckily we are having beautiful weather in these parts so we are going to have the entire brunch outside. I've been browsing around looking for inspiration and ideas for centerpieces and flower arrangements. Trying to keep things on a budget is important so I am going to be scouring thrift stores over the next couple of days looking for things I can use. 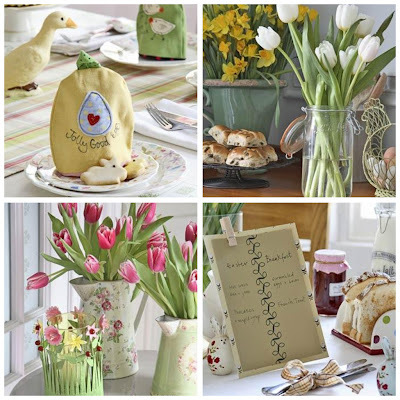 I really love some of the ideas pictured below like the tulips in the canning jar. Tulips are so synonymous with spring, don't you think? I also love the flowers in tea cups, this is such a great idea for vintage tea cups. I think they would look so cute on each person's place setting. 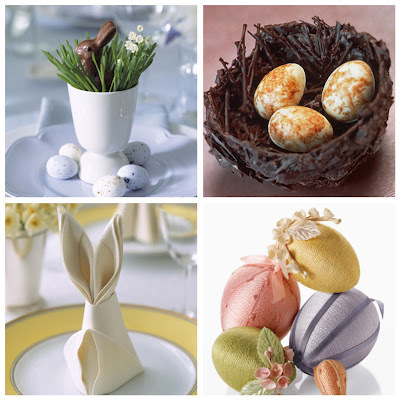 I'm also thinking of attempting those chocolate nests from Martha Stewart, although maybe it's a bit too ambitious, Martha makes it sound easy but that's why she is Martha! She makes everything sound easy! What are your plans for Easter? Are you hosting a brunch or dinner? 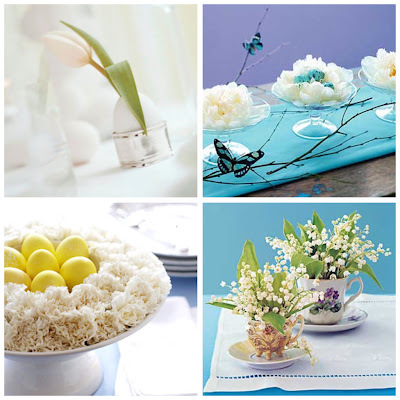 I would love to hear your ideas for Easter and Spring decorating! 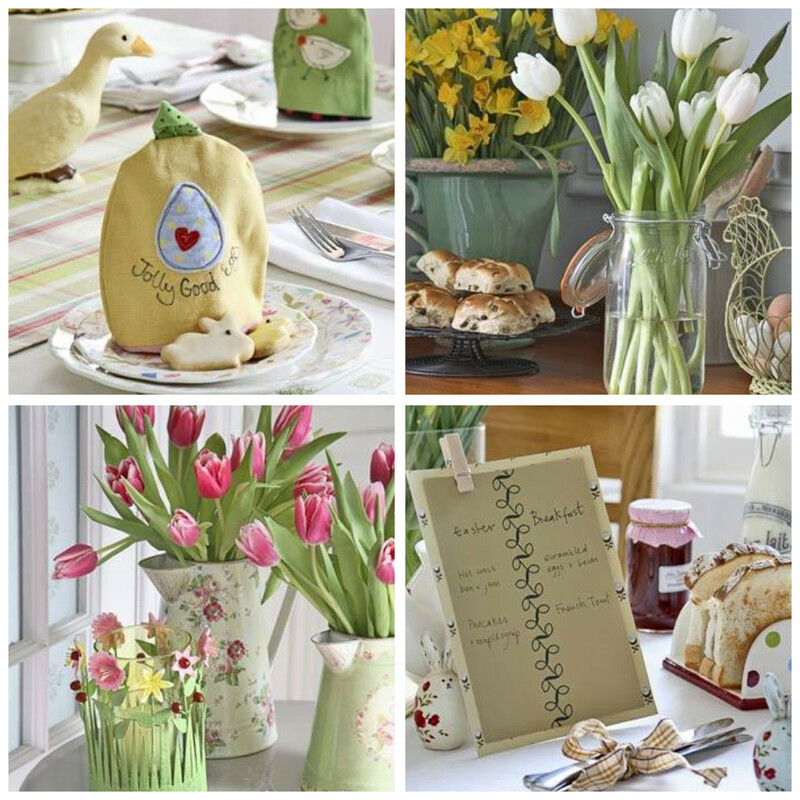 I am actually not hosting Easter this year but im glad...I like to use old glass jars and wrap ribbon around them...I have saved soy sauce bottles peppercorn bottles basically its a collection of different sizes...I love tulips! but you could also use ranunculus and daffodils they are pretty inexpensive right now and I try to use stuff from the garden too!I am sure it will be lovely whatever you do...be sure to post photos! Thank! These are really helpful tips!